Worms Armageddon Game Review - Download and Play Free Version! The Funniest Turn Based Strategy Game Ever Created! It's Worms: Armageddon, the improved third chapter in the wildly popular Worms series of turn-based strategy games! Just as in the first two installments, you lead a small army of worms against an opposing force. Use every weapon and device available to you to knock out the bad guys and win the day - how to do it is up to you! How about a cocktail bomb on the heads of enemy worms thrown from a cliff above? What about a carefully thrown stick of dynamite that lands in the middle of a worm troup stuck in a valley? You could even activate your jet pack and drop a land mine on worst enemy! However you decide to wreck havoc, you will have a blast doing it! The 2D Worms: Armageddon battle environments perfectly fit the game's style of play, which is simple, fast-paced, and fun! Each worm starts out with 100 health points and loses them according to which weapons hit him or her. There are so many strategies and options to use that Worms: Armageddon keeps you going for a long, long time. Do maximum damage to the enemies' worms, but be careful not to leave your own troops in harm's way! In addition to normal team-versus-team gameplay, Worms: Armageddon also comes with 43 single-player missions, and each scenario you beat will unlock that map for normal play. Bazooka, uzi, air strike, baseball bat, shotgun - all the familiar weapons are here, and there's lots of new ones too! To make things even crazier, watch for crates floating down from the sky because they may contain a secret weapon! Carpet bomb, mail strike, Ming vase, overweight game producer - can you find them all? The Same Great Worms Experience for All Ages - Only Better! One of the most unique games you'll find anywhere, Worms: Armageddon has all the charm and entertainment value of its predecessors, and more. Besides the hilarious concept of cute little worms doing their darndest to annihilate each other, all the action in Worms: Armageddon plays out with comical animations and simple but effective graphics. You'll be laughing out loud at the game's sound effects and your worms' silly sayings. Game controls are easy and intuitive to learn and use, so let the shenanigans begin! Pick a name for your team, and name each individual worm after politicians, movie stars, athletes, or even your friends, because you can call them anything you want! Out of dozens of possibilities, choose a team flag, nationality, and what voice accents your worms will have. The fun doesn't stop there, since there are also tons of different gameplay options that you can customize and change, from weapons and health power ups to number of worms per team. Explore them all to get the very best Worms: Armageddon experience! Play Alone, With friends, or on the Internet! 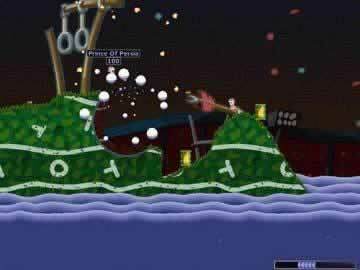 Worms: Armageddon includes the best variety of gameplay ever seen in a Worms game! Play the computer in the 43 single-player missions as well as Deathmatch Challenge. You can also face off against a friend on your own computer or over a local network. For a real challenge, log on to the Wormnet and put your skills to the test against the best of the best! Whether you're a devoted fan of the Worms series or have never heard of it, Worms: Armageddon is sure to be an eyeopener. Action, intrigue, strategy, suspense, and fun - Worms: Armageddon has it all! Secret Weapons? - Can you find all the secret weapons dropped in crates during gameplay? There are some awesome ones waiting to be found and used like the carpet bomb, mail strike, ming vase...even an overweight game producer ? Worms Armageddon is a thrilling turn-based strategy game that anyone could enjoy. Teams of up to eight worms do battle with an array of devastating and outlandish weapons ranging from banana bombs to a concrete donkey. Create the battle as you see fit by customizing weapons and levels. Great multiplayer support gives you a number of ways to take on friends or play against computer opponents suited to your skill level. Campaign and Deathmatch modes pit you in challenging contests against computer opponents. This game is a whole lot of strategy, a whole lot of hilarity, and just plain fun. 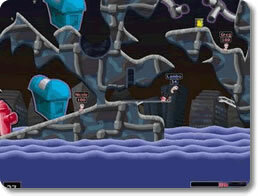 Worms Armageddon brings with it the fun and exciting battles of previous Worms games. Battle takes place between two or more teams of worms. Each team can have anywhere from 1-8 worms. These teams can either be player controlled or computer controlled. Once you've created the teams for your battle, you'll be able to select a level to play, choose a randomly generated one, or even create your own. You'll also be able to change options for the battle (such as how powerful weapons are, how much health each worm has, etc.). Once you've finished setting up the battle, the action begins. The worms on each team will be randomly placed throughout the level and your goal is to eliminate as many other worms as possible and be the last team standing. The biggest difference between Worms Armageddon and previous Worms games (like Worms 2) are the additions of Campaign and Deathmatch modes. These modes pit you against the computer in increasingly difficult challenges that will have you outnumbered and outgunned. These new modes require you to think hard and conserve resources to complete. An excellent improvement to the offering for solo play. One great feature of the game is the level of control and customization available. When creating or editing teams you can choose not only the team name, but the names of individual worms as well. You can even change the accents of the voice that your worms use. Of course, the options aren't limited to cosmetic changes. You have a huge array of choices and options to make when it comes to weapons as well. You can change the ammunition of a weapon, the damage a weapon will deal, the size of the explosion a weapon generates, and even more. You can change how much health the worms have, how long the game will last before sudden death starts, the length of each turn, and a number of other options that give you an unbelievable amount of control over the battles. As a result of the ability to customize and control nearly every aspect of battle, the difficulty can be adjusted in any number of ways to suit your skill or needs. Additionally, the computer controlled teams can have their difficulty level adjusted higher or lower to provide the right challenge. You can challenge yourself with tough and drawn out conflicts, or relax in a quick and easy game as you blow away your opponents. Unfortunately, you don't have this level of control or difficulty settings for Campaign mode. The training missions required to start the campaign can be very difficult and failure on any one requires you to redo all of them. The campaign missions themselves can also be extremely difficult to finish. The difficulty can be frustrating, although you can always resort to the great multiplayer battles if you find yourself stuck. The ability to play against other players and the number of ways in which you can do so is another positive point in Worms Armageddon. You can take on other players on a single computer, over your local computer network in LAN play, or on the Internet. Beating computers is fun, but there's nothing more satisfying than being able to take on friends in a violent free-for-all. The controls are simple and easy to learn, despite the lack of any sort of tutorial. You can look around the map by moving the mouse. Worms are moved left or right with the corresponding arrow keys, and jump with the Enter key. The various weapons are selected with F1-F12, and fired with the Space Bar. When it is your turn, you can choose which worm to use by using the Tab key. While a tutorial of some sort would have been a nice addition, not having one isn't a huge hindrance to playing the game. 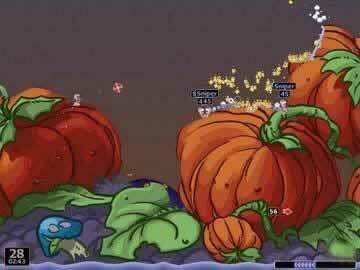 The “cartoony” 2D visuals of Worms Armageddon work well for the game and really bring an element of humor that adds to the fun you'll have. There's some strange satisfaction in watching as the worms bounce around from explosions and fires, or explode on death. The sounds in the game also add to the hilarity. As the worms move around and shoot each other, they'll make various comments on what is happening. For example, if a worm manages to damage a teammate with a weapon, you might hear a remark about him being a traitor. On top of the funny comments, the ability to change accents of worms makes them an even bigger laugh. Despite the simplicity, the visuals and audio are great additions to the game. Worms Armageddon is an excellent turn-based strategy game that will be great entertainment for the strategy buff and everyone else as well. Do battle with an array of devastating and outlandish weapons like the Holy Hand Grenade. Customize an unbelievable number of options to create a battle that's perfect for you. Tests your skills against computer opponents or take advantage of the multiplayer offerings and battle against other players. Humorous looks and sounds add the perfect touch to an amazing game. Definitely a game well worth playing. Player created video showing some funny worm battles.